Really nice to be back home after a stressful week in UK. Also got some great stuff coming up on the blog soon. 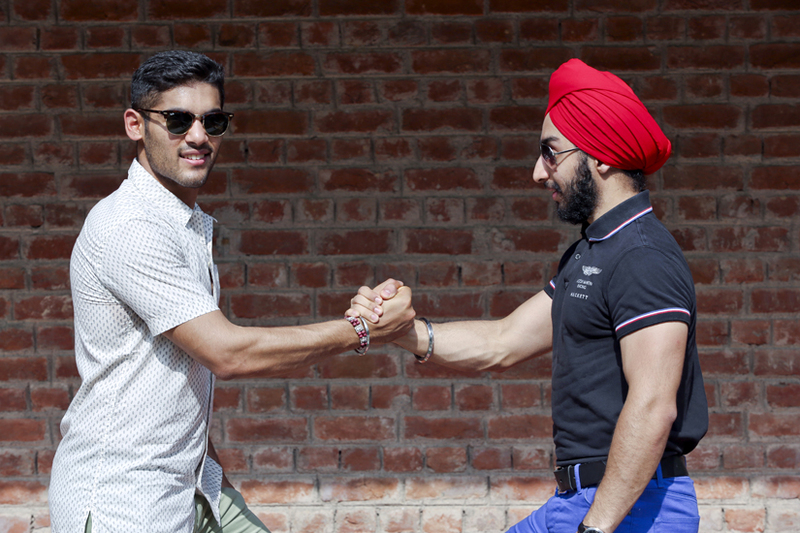 I wanna introduce y'all to my really good friend Shabeg Singh from Mr. Singh Style who I collaborated with for this post. I've known Shabeg for quite a long time, he recently started his personal style blog to share his zeal for fashion and has had a remarkable journey till now and I hope the same for the future. His style is a very good mix of colors and prints, apart from that the guy dresses up soothingly smart. He's also on Instagram @Mrsinghstyle so feel free to have a quick look. He's currently pursuing Business Management at Monash University in Melbourne. Cheeky fact about this lad: He's quite popular at uni as a professional Bhangra dancer and a fashion blogger. Summers are quite long and hot in Delhi, therefore I prefer to tackle it by styling myself with light colors during the day as they reflect heat compared to darker colors. Chinos seemed a better option than denim, wherein I chose to sport these olive colored ones, which went quite well with a simple printed shirt and brown shoes. What's your summer wardrobe look like? Good outfits. I like the red shoes and touch the turban I like it! !